For other uses, see Knights Templar (disambiguation) and Templar (disambiguation). The Poor Fellow-Soldiers of Christ and of the Temple of Solomon (Latin: Pauperes commilitones Christi Templique Salomonici), also known as the Order of Solomon's Temple, the Knights Templar or simply the Templars, were a Catholic military order recognised in 1139 by the papal bull Omne datum optimum. The order was founded in 1119 and was active until 1312 when it was perpetually suppressed by Pope Clement V by the bull Vox in excelso. The Templars became a favoured charity throughout Christendom and grew rapidly in membership and power. They were prominent in Christian finance. Templar knights, in their distinctive white mantles with a red cross, were among the most skilled fighting units of the Crusades. Non-combatant members of the order, who formed as much as 90% of the order's members, managed a large economic infrastructure throughout Christendom, developing innovative financial techniques that were an early form of banking, building its own network of nearly 1,000 commanderies and fortifications across Europe and the Holy Land, and arguably forming the world's first multinational corporation. The Templars were closely tied to the Crusades; when the Holy Land was lost, support for the order faded. Rumours about the Templars' secret initiation ceremony created distrust, and King Philip IV of France – deeply in debt to the order – took advantage of this distrust to destroy them and erase his debt. 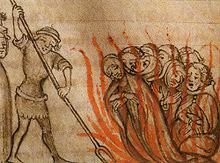 In 1307, he had many of the order's members in France arrested, tortured into giving false confessions, and burned at the stake. Pope Clement V disbanded the order in 1312 under pressure from King Philip. The abrupt reduction in power of a significant group in European society gave rise to speculation, legend, and legacy through the ages. Flag used by the Templars in battle. In 1119, the French knight Hugues de Payens approached King Baldwin II of Jerusalem and Warmund, Patriarch of Jerusalem, and proposed creating a monastic order for the protection of these pilgrims. King Baldwin and Patriarch Warmund agreed to the request, probably at the Council of Nablus in January 1120, and the king granted the Templars a headquarters in a wing of the royal palace on the Temple Mount in the captured Al-Aqsa Mosque. The Temple Mount had a mystique because it was above what was believed to be the ruins of the Temple of Solomon. The Crusaders therefore referred to the Al-Aqsa Mosque as Solomon's Temple, and from this location the new order took the name of Poor Knights of Christ and the Temple of Solomon, or "Templar" knights. The order, with about nine knights including Godfrey de Saint-Omer and André de Montbard, had few financial resources and relied on donations to survive. Their emblem was of two knights riding on a single horse, emphasising the order's poverty. The impoverished status of the Templars did not last long. They had a powerful advocate in Saint Bernard of Clairvaux, a leading Church figure, the French abbot primarily responsible for the founding of the Cistercian Order of monks and a nephew of André de Montbard, one of the founding knights. Bernard put his weight behind them and wrote persuasively on their behalf in the letter 'In Praise of the New Knighthood', and in 1129, at the Council of Troyes, he led a group of leading churchmen to officially approve and endorse the order on behalf of the church. With this formal blessing, the Templars became a favoured charity throughout Christendom, receiving money, land, businesses, and noble-born sons from families who were eager to help with the fight in the Holy Land. Another major benefit came in 1139, when Pope Innocent II's papal bull Omne Datum Optimum exempted the order from obedience to local laws. This ruling meant that the Templars could pass freely through all borders, were not required to pay any taxes, and were exempt from all authority except that of the pope. With its clear mission and ample resources, the order grew rapidly. Templars were often the advance shock troops in key battles of the Crusades, as the heavily armoured knights on their warhorses would set out to charge at the enemy, ahead of the main army bodies, in an attempt to break opposition lines. 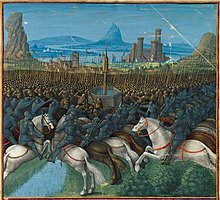 One of their most famous victories was in 1177 during the Battle of Montgisard, where some 500 Templar knights helped several thousand infantry to defeat Saladin's army of more than 26,000 soldiers. "A Templar Knight is truly a fearless knight, and secure on every side, for his soul is protected by the armour of faith, just as his body is protected by the armour of steel. He is thus doubly armed, and need fear neither demons nor men." Although the primary mission of the order was militaristic, relatively few members were combatants. The others acted in support positions to assist the knights and to manage the financial infrastructure. The Templar Order, though its members were sworn to individual poverty, was given control of wealth beyond direct donations. A nobleman who was interested in participating in the Crusades might place all his assets under Templar management while he was away. Accumulating wealth in this manner throughout Christendom and the Outremer, the order in 1150 began generating letters of credit for pilgrims journeying to the Holy Land: pilgrims deposited their valuables with a local Templar preceptory before embarking, received a document indicating the value of their deposit, then used that document upon arrival in the Holy Land to retrieve their funds in an amount of treasure of equal value. This innovative arrangement was an early form of banking and may have been the first formal system to support the use of cheques; it improved the safety of pilgrims by making them less attractive targets for thieves, and also contributed to the Templar coffers. Based on this mix of donations and business dealing, the Templars established financial networks across the whole of Christendom. They acquired large tracts of land, both in Europe and the Middle East; they bought and managed farms and vineyards; they built massive stone cathedrals and castles; they were involved in manufacturing, import and export; they had their own fleet of ships; and at one point they even owned the entire island of Cyprus. The Order of the Knights Templar arguably qualifies as the world's first multinational corporation. In the mid-12th century, the tide began to turn in the Crusades. The Muslim world had become more united under effective leaders such as Saladin. Dissension arose among Christian factions in and concerning the Holy Land. The Knights Templar were occasionally at odds with the two other Christian military orders, the Knights Hospitaller and the Teutonic Knights, and decades of internecine feuds weakened Christian positions, both politically and militarily. After the Templars were involved in several unsuccessful campaigns, including the pivotal Battle of Hattin, Jerusalem was recaptured by Muslim forces under Saladin in 1187. The Holy Roman Emperor Frederick II reclaimed the city for Christians in the Sixth Crusade of 1229, without Templar aid, but only held it briefly for a little more than a decade. In 1244, the Ayyubid dynasty together with Khwarezmi mercenaries recaptured Jerusalem, and the city did not return to Western control until 1917 when, during World War I, the British captured it from the Ottoman Empire. The Templars were forced to relocate their headquarters to other cities in the north, such as the seaport of Acre, which they held for the next century. It was lost in 1291, followed by their last mainland strongholds, Tortosa (Tartus in what is now Syria) and Atlit in present-day Israel. Their headquarters then moved to Limassol on the island of Cyprus, and they also attempted to maintain a garrison on tiny Arwad Island, just off the coast from Tortosa. In 1300, there was some attempt to engage in coordinated military efforts with the Mongols via a new invasion force at Arwad. In 1302 or 1303, however, the Templars lost the island to the Egyptian Mamluk Sultanate in the Siege of Arwad. With the island gone, the Crusaders lost their last foothold in the Holy Land. With the order's military mission now less important, support for the organization began to dwindle. The situation was complex, however, since during the two hundred years of their existence, the Templars had become a part of daily life throughout Christendom. 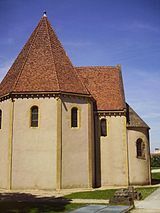 The organisation's Templar Houses, hundreds of which were dotted throughout Europe and the Near East, gave them a widespread presence at the local level. The Templars still managed many businesses, and many Europeans had daily contact with the Templar network, such as by working at a Templar farm or vineyard, or using the order as a bank in which to store personal valuables. The order was still not subject to local government, making it everywhere a "state within a state" – its standing army, though it no longer had a well-defined mission, could pass freely through all borders. This situation heightened tensions with some European nobility, especially as the Templars were indicating an interest in founding their own monastic state, just as the Teutonic Knights had done in Prussia and the Knights Hospitaller were doing in Rhodes. In 1305, the new Pope Clement V, based in Avignon, France, sent letters to both the Templar Grand Master Jacques de Molay and the Hospitaller Grand Master Fulk de Villaret to discuss the possibility of merging the two orders. Neither was amenable to the idea, but Pope Clement persisted, and in 1306 he invited both Grand Masters to France to discuss the matter. De Molay arrived first in early 1307, but de Villaret was delayed for several months. While waiting, De Molay and Clement discussed criminal charges that had been made two years earlier by an ousted Templar and were being discussed by King Philip IV of France and his ministers. It was generally agreed that the charges were false, but Clement sent the king a written request for assistance in the investigation. According to some historians, King Philip, who was already deeply in debt to the Templars from his war with the English, decided to seize upon the rumours for his own purposes. He began pressuring the church to take action against the order, as a way of freeing himself from his debts. Convent of Christ Castle in Tomar, Portugal. Built in 1160 as a stronghold for the Knights Templar, it became the headquarters of the renamed Order of Christ. In 1983, it was named a UNESCO World Heritage Site. At dawn on Friday, 13 October 1307 (a date sometimes linked with the origin of the Friday the 13th superstition) King Philip IV ordered de Molay and scores of other French Templars to be simultaneously arrested. The arrest warrant started with the phrase: "Dieu n'est pas content, nous avons des ennemis de la foi dans le Royaume" ["God is not pleased. We have enemies of the faith in the kingdom"]. Claims were made that during Templar admissions ceremonies, recruits were forced to spit on the Cross, deny Christ, and engage in indecent kissing; brethren were also accused of worshipping idols, and the order was said to have encouraged homosexual practices. The Templars were charged with numerous other offences such as financial corruption, fraud, and secrecy. Many of the accused confessed to these charges under torture, and their confessions, even though obtained under duress, caused a scandal in Paris. The prisoners were coerced to confess that they had spat on the Cross: "Moi, Raymond de La Fère, 21 ans, reconnais que [j'ai] craché trois fois sur la Croix, mais de bouche et pas de cœur" ("I, Raymond de La Fère, 21 years old, admit that I have spat three times on the Cross, but only from my mouth and not from my heart"). The Templars were accused of idolatry and were suspected of worshiping either a figure known as Baphomet or a mummified severed head they recovered, amongst other artifacts, at their original headquarters on the Temple Mount that many scholars theorize might have been that of John the Baptist, among other things. Relenting to Phillip's demands, Pope Clement then issued the papal bull Pastoralis praeeminentiae on 22 November 1307, which instructed all Christian monarchs in Europe to arrest all Templars and seize their assets. Pope Clement called for papal hearings to determine the Templars' guilt or innocence, and once freed of the Inquisitors' torture, many Templars recanted their confessions. Some had sufficient legal experience to defend themselves in the trials, but in 1310, having appointed the archbishop of Sens, Philippe de Marigny, to lead the investigation, Philip blocked this attempt, using the previously forced confessions to have dozens of Templars burned at the stake in Paris. With Philip threatening military action unless the pope complied with his wishes, Pope Clement finally agreed to disband the order, citing the public scandal that had been generated by the confessions. At the Council of Vienne in 1312, he issued a series of papal bulls, including Vox in excelso, which officially dissolved the order, and Ad providam, which turned over most Templar assets to the Hospitallers. As for the leaders of the order, the elderly Grand Master Jacques de Molay, who had confessed under torture, retracted his confession. Geoffroi de Charney, Preceptor of Normandy, also retracted his confession and insisted on his innocence. Both men were declared guilty of being relapsed heretics, and they were sentenced to burn alive at the stake in Paris on 18 March 1314. De Molay reportedly remained defiant to the end, asking to be tied in such a way that he could face the Notre Dame Cathedral and hold his hands together in prayer. According to legend, he called out from the flames that both Pope Clement and King Philip would soon meet him before God. His actual words were recorded on the parchment as follows : "Dieu sait qui a tort et a péché. Il va bientot arriver malheur à ceux qui nous ont condamnés à mort" ("God knows who is wrong and has sinned. Soon a calamity will occur to those who have condemned us to death"). Pope Clement died only a month later, and King Philip died in a hunting accident before the end of the year. The remaining Templars around Europe were either arrested and tried under the Papal investigation (with virtually none convicted), absorbed into other Catholic military orders, or pensioned off and allowed to live out their days peacefully. By papal decree, the property of the Templars was transferred to the Knights Hospitaller except in the Kingdoms of Castile, Aragon, and Portugal. Portugal was the first country in Europe where they had settled, occurring only two or three years after the orders foundation in Jerusalem and even having presence during Portugal's conception. With the protection of the Portuguese king, Denis I, who refused to pursue and persecute the former knights as had occurred in all other sovereign states under the influence of the Catholic Church, in effect, causing the dissolution of the Templars. Templar organizations simply changed their name, from Knights Templar to the renown Order of Christ and also a parallel Supreme Order of Christ of the Holy See in which both are considered the successors. In September 2001, a document known as the Chinon Parchment dated 17–20 August 1308 was discovered in the Vatican Secret Archives by Barbara Frale, apparently after having been filed in the wrong place in 1628. It is a record of the trial of the Templars and shows that Clement absolved the Templars of all heresies in 1308 before formally disbanding the order in 1312, as did another Chinon Parchment dated 20 August 1308 addressed to Philip IV of France, also mentioning that all Templars that had confessed to heresy were "restored to the Sacraments and to the unity of the Church". This other Chinon Parchment has been well known to historians, having been published by Étienne Baluze in 1693 and by Pierre Dupuy in 1751. The current position of the Roman Catholic Church is that the medieval persecution of the Knights Templar was unjust, that nothing was inherently wrong with the order or its rule, and that Pope Clement was pressed into his actions by the magnitude of the public scandal and by the dominating influence of King Philip IV, who was Clement's relative. Templar chapel from the 12th century in Metz, France. Once part of the Templar commandery of Metz, the oldest Templar institution of the Holy Roman Empire. The Templars were organized as a monastic order similar to Bernard's Cistercian Order, which was considered the first effective international organization in Europe. The organizational structure had a strong chain of authority. Each country with a major Templar presence (France, Poitou, Anjou, Jerusalem, England, Aragon (Spain), Portugal, Italy, Tripoli, Antioch, Hungary, and Croatia) had a Master of the Order for the Templars in that region. All of them were subject to the Grand Master, appointed for life, who oversaw both the order's military efforts in the East and their financial holdings in the West. The Grand Master exercised his authority via the visitors-general of the order, who were knights specially appointed by the Grand Master and convent of Jerusalem to visit the different provinces, correct malpractices, introduce new regulations, and resolve important disputes. The visitors-general had the power to remove knights from office and to suspend the Master of the province concerned. No precise numbers exist, but it is estimated that at the order's peak there were between 15,000 and 20,000 Templars, of whom about a tenth were actual knights. There was a threefold division of the ranks of the Templars: the noble knights, the non-noble sergeants, and the chaplains. The Templars did not perform knighting ceremonies, so any knight wishing to become a Knight Templar had to be a knight already. They were the most visible branch of the order, and wore the famous white mantles to symbolize their purity and chastity. They were equipped as heavy cavalry, with three or four horses and one or two squires. Squires were generally not members of the order but were instead outsiders who were hired for a set period of time. Beneath the knights in the order and drawn from non-noble families were the sergeants. They brought vital skills and trades from blacksmiths and builders, including administration of many of the order's European properties. In the Crusader States, they fought alongside the knights as light cavalry with a single horse. Several of the order's most senior positions were reserved for sergeants, including the post of Commander of the Vault of Acre, who was the de facto Admiral of the Templar fleet. The sergeants wore black or brown. From 1139, chaplains constituted a third Templar class. They were ordained priests who cared for the Templars' spiritual needs. All three classes of brother wore the order's red cross. Starting with founder Hugues de Payens in 1118–1119, the order's highest office was that of Grand Master, a position which was held for life, though considering the martial nature of the order, this could mean a very short tenure. All but two of the Grand Masters died in office, and several died during military campaigns. For example, during the Siege of Ascalon in 1153, Grand Master Bernard de Tremelay led a group of 40 Templars through a breach in the city walls. When the rest of the Crusader army did not follow, the Templars, including their Grand Master, were surrounded and beheaded. Grand Master Gérard de Ridefort was beheaded by Saladin in 1189 at the Siege of Acre. The Grand Master oversaw all of the operations of the order, including both the military operations in the Holy Land and Eastern Europe and the Templars' financial and business dealings in Western Europe. Some Grand Masters also served as battlefield commanders, though this was not always wise: several blunders in de Ridefort's combat leadership contributed to the devastating defeat at the Battle of Hattin. The last Grand Master was Jacques de Molay, burned at the stake in Paris in 1314 by order of King Philip IV. 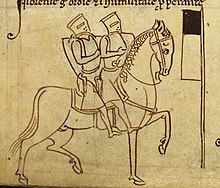 Depiction of two Templars seated on a horse (emphasising poverty), with Beauséant, the "sacred banner" (or gonfanon) of the Templars, argent a chief sable (Matthew Paris, c. 1250). Bernard de Clairvaux and founder Hugues de Payens devised a specific code of conduct for the Templar Order, known to modern historians as the Latin Rule. Its 72 clauses laid down the details of the knights' way of life, including the types of garments they were to wear and how many horses they could have. Knights were to take their meals in silence, eat meat no more than three times per week, and not have physical contact of any kind with women, even members of their own family. A Master of the Order was assigned "4 horses, and one chaplain-brother and one clerk with three horses, and one sergeant brother with two horses, and one gentleman valet to carry his shield and lance, with one horse." As the order grew, more guidelines were added, and the original list of 72 clauses was expanded to several hundred in its final form. The knights wore a white surcoat with a red cross, and a white mantle also with a red cross; the sergeants wore a black tunic with a red cross on the front and a black or brown mantle. The white mantle was assigned to the Templars at the Council of Troyes in 1129, and the cross was most probably added to their robes at the launch of the Second Crusade in 1147, when Pope Eugenius III, King Louis VII of France, and many other notables attended a meeting of the French Templars at their headquarters near Paris. Under the Rule, the knights were to wear the white mantle at all times: they were even forbidden to eat or drink unless wearing it. The red cross that the Templars wore on their robes was a symbol of martyrdom, and to die in combat was considered a great honour that assured a place in heaven. There was a cardinal rule that the warriors of the order should never surrender unless the Templar flag had fallen, and even then they were first to try to regroup with another of the Christian orders, such as that of the Hospitallers. Only after all flags had fallen were they allowed to leave the battlefield. Although not prescribed by the Templar Rule, it later became customary for members of the order to wear long and prominent beards. In about 1240, Alberic of Trois-Fontaines described the Templars as an "order of bearded brethren"; while during the interrogations by the papal commissioners in Paris in 1310–1311, out of nearly 230 knights and brothers questioned, 76 are described as wearing a beard, in some cases specified as being "in the style of the Templars", and 133 are said to have shaved off their beards, either in renunciation of the order or because they had hoped to escape detection. Initiation, known as Reception (receptio) into the order, was a profound commitment and involved a solemn ceremony. Outsiders were discouraged from attending the ceremony, which aroused the suspicions of medieval inquisitors during the later trials. New members had to willingly sign over all of their wealth and goods to the order and take vows of poverty, chastity, piety, and obedience. Most brothers joined for life, although some were allowed to join for a set period. Sometimes a married man was allowed to join if he had his wife's permission, but he was not allowed to wear the white mantle. Temple Church, London. 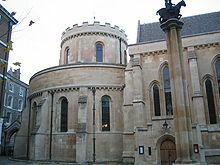 As the chapel of the New Temple in London, it was the location for Templar initiation ceremonies. In modern times it is the parish church of the Middle and Inner Temples, two of the Inns of Court, and a popular tourist attraction. With their military mission and extensive financial resources, the Knights Templar funded a large number of building projects around Europe and the Holy Land. Many of these structures are still standing. Many sites also maintain the name "Temple" because of centuries-old association with the Templars. For example, some of the Templars' lands in London were later rented to lawyers, which led to the names of the Temple Bar gateway and the Temple Underground station. Two of the four Inns of Court which may call members to act as barristers are the Inner Temple and Middle Temple – the entire area known as Temple, London. Distinctive architectural elements of Templar buildings include the use of the image of "two knights on a single horse", representing the Knights' poverty, and round buildings designed to resemble the Church of the Holy Sepulchre in Jerusalem. A lodge of the International Order of Good Templars in Vågå, Norway. The story of the persecution and sudden dissolution of the secretive yet powerful medieval Templars has drawn many other groups to use alleged connections with them as a way of enhancing their own image and mystery. The Knights Templar were dismantled in the Rolls of the Catholic Church in 1309 with the death of Jacques de Molay; there is no clear historical connection between them and any modern organization, the earliest of which emerged publicly in the 18th century. Many temperance organizations named themselves after the Poor Fellow-Soldiers of Christ and of the Temple of Solomon, citing the belief that the original Knights Templar "drank sour milk, and also because they were fighting 'a great crusade' against 'this terrible vice' of alcohol." The largest of these, the International Order of Good Templars (IOGT), grew throughout the world after being started in the 19th century and continues to advocate for the abstinence from alcohol and other drugs. The Sovereign Military Order of the Temple of Jerusalem is a self-styled order established in 1804 and "accredited as a nongovernmental organization NGO) by the UN in 2001." It is ecumenical in that it admits Christians of many denominations in its ranks. Its founder, Bernard-Raymond Fabré-Palaprat, produced the Larmenius Charter in order to try to link it with the original Catholic Christian military order. Freemasonry has incorporated the symbols and rituals of several medieval military orders in a number of Masonic bodies since the 18th century at least. This can be seen in the "Red Cross of Constantine," inspired by the Military Constantinian Order; the "Order of Malta," inspired by the Knights Hospitaller; and the "Order of the Temple", inspired by the Knights Templar. The Orders of Malta and the Temple feature prominently in the York Rite. One theory on the origin of Freemasonry claims direct descent from the historical Knights Templar through its final fourteenth-century members who allegedly took refuge in Scotland and aided Robert the Bruce in his victory at Bannockburn. This theory is usually rejected by both Masonic authorities and historians due to lack of evidence. The Knights Templar have become associated with legends concerning secrets and mysteries handed down to the select from ancient times. Rumours circulated even during the time of the Templars themselves. Masonic writers added their own speculations in the 18th century, and further fictional embellishments have been added in popular novels such as Ivanhoe, Foucault's Pendulum, and the Da Vinci Code, modern movies such as National Treasure, the Last Templar, and Indiana Jones and the Last Crusade, as well as video games such as Broken Sword and Assassin's Creed. Beginning in the 1960s, there have been speculative popular publications surrounding the order's early occupation of the Temple Mount in Jerusalem and speculation about what relics the Templars may have found there, such as the Holy Grail or the Ark of the Covenant, or the historical accusation of idol worship (Baphomet) transformed into a context of "witchcraft". Holy Blood Holy Grail, a book by Michael Baigent, Richard Leigh, and Henry Lincoln, is an example of a speculative theory on how the Knights Templar were connected with the Holy Grail. The association of the Holy Grail with the Templars has precedents even in 12th-century fiction; Wolfram von Eschenbach's Parzival calls the knights guarding the Grail Kingdom templeisen, apparently a conscious fictionalisation of the templarii. ^ Archer, Thomas Andrew; Kingsford, Charles Lethbridge (1894). The Crusades: The Story of the Latin Kingdom of Jerusalem. T. Fisher Unwin. p. 176. ; Burgtorf, Jochen (2008). The central convent of Hospitallers and Templars : history, organization, and personnel (1099/1120–1310). Leiden: Brill. pp. 545–46. ISBN 978-90-04-16660-8. ^ a b c Burman 1990, p. 45. By Molay's time the Grand Master was presiding over at least 970 houses, including commanderies and castles in the east and west, serviced by a membership which is unlikely to have been less than 7,000, excluding employees and dependents, who must have been seven or eight times that number. ^ Barber, Malcolm (1995). The new knighthood : a history of the Order of the Temple (Canto ed.). Cambridge, UK: Cambridge University Press. pp. xxi–xxii. ISBN 978-0-521-55872-3. ^ a b c d e The History Channel, Decoding the Past: The Templar Code, 7 November 2005, video documentary written by Marcy Marzuni. ^ Selwood, Dominic (2002). Knights of the Cloister. Templars and Hospitallers in Central-Southern Occitania 1100–1300. Woodbridge: The Boydell Press. ISBN 978-0851158280. ^ Martin 2005, p. 47. ^ Nicholson 2001, p. 4. ^ a b c d The History Channel, Lost Worlds: Knights Templar, 10 July 2006, video documentary written and directed by Stuart Elliott. ^ a b Ralls, Karen (2007). Knights Templar Encyclopedia. Career Press. p. 28. ISBN 978-1-56414-926-8. ^ Miller, Duane (2017). 'Knights Templar' in War and Religion, Vol. 2. Santa Barbara, California: ABC–CLIO. pp. 462–64. Retrieved 28 May 2017. ^ Burman 1990, pp. 13, 19. ^ Selwood, Dominic (2013-04-20). "Birth of the Order". Retrieved 20 April 2013. ^ Barber 1994, p. 7. ^ Selwood, Dominic (2013-05-28). "The Knights Templar 4: St Bernard of Clairvaux". Retrieved 29 May 2013. ^ Selwood, Dominic (1996). 'Quidam autem dubitaverunt: the Saint, the Sinner and a Possible Chronology', in Autour de la Première Croisade. Paris: Publications de la Sorbonne. pp. 221–30. ISBN 978-2859443085. ^ Burman 1990, p. 40. ^ Stephen A. Dafoe. "In Praise of the New Knighthood". TemplarHistory.com. Retrieved 20 March 2007. ^ a b Martin 2005. ^ Benson, Michael (2005). Inside Secret Societies. Kensington Publishing Corp. p. 90. ^ Martin 2005, p. 99. ^ Martin 2005, p. 113. ^ Demurger, p. 139 "During four years, Jacques de Molay and his order were totally committed, with other Christian forces of Cyprus and Armenia, to an enterprise of reconquest of the Holy Land, in liaison with the offensives of Ghazan, the Mongol Khan of Persia. The Templars retained a base on Arwad island (also known as Ruad island, formerly Arados) off Tortosa (Tartus) until October 1302 or 1303, when the island was recaptured by the Mamluks. ^ Nicholson 2001, p. 5. ^ Nicholson 2001, p. 237. 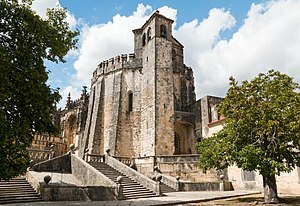 ^ "Convent of Christ in Tomar". World Heritage Site. Archived from the original on 31 December 2006. Retrieved 20 March 2007. ^ "Friday the 13th". snopes.com. Retrieved 26 March 2007. ^ David Emery. "Why Friday the 13th is unlucky". urbanlegends.about.com. Retrieved 26 March 2007. ^ a b "Les derniers jours des Templiers". Science et Avenir: 52–61. July 2010. ^ Riley-Smith, Johnathan (1995). The Oxford Illustrated History of the Crusades. Oxford: Oxford Press. p. 213. ^ Barber 1993, p. 178. ^ Edgeller, Johnathan (2010). Taking the Templar Habit: Rule, Initiation Ritual, and the Accusations against the Order (PDF). Texas Tech University. pp. 62–66. Archived from the original (PDF) on 30 April 2011. ^ Martin 2005, p. 118. ^ Martin 2005, p. 122. ^ Sobecki 2006, p. 963. ^ a b Barber 1993, p. 3. ^ Martin 2005, p. 123–24. ^ Martin 2005, p. 125. ^ Martin 2005, p. 140. ^ a b Moeller 1912. ^ Herbermann, Charles, ed. (1913). "Order of the Knights of Christ" . Catholic Encyclopedia. New York: Robert Appleton Company. ^ Martin 2005, pp. 140–42. ^ Matthew Anthony Fitzsimons; Jean Bécarud (1969). The Catholic Church today: Western Europe. University of Notre Dame Press. p. 159. ^ Helen J. Nicholson (1 January 2004). The Crusades. Greenwood Publishing Group. p. 98. ISBN 978-0-313-32685-1. ^ Noonan, Jr., James-Charles (1996). The Church Visible: The Ceremonial Life and Protocol of the Roman Catholic Church. Viking. p. 196. ISBN 978-0-670-86745-5. ^ Robert Ferguson (26 August 2011). The Knights Templar and Scotland. History Press Limited. p. 39. ISBN 978-0-7524-6977-5. ^ Jochen Burgtorf; Paul F. Crawford; Helen J. Nicholson (28 June 2013). The Debate on the Trial of the Templars (1307–1314). Ashgate Publishing, Ltd. p. 298. ISBN 978-1-4094-8102-7. ^ "Long-lost text lifts cloud from Knights Templar". msn.com. 12 October 2007. Retrieved 12 October 2007. ^ Charles d' Aigrefeuille, Histoire de la ville de Montpellier, Volume 2, p. 193 (Montpellier: J. Martel, 1737–1739). ^ Sophia Menache, Clement V, p. 218, 2002 paperback edition ISBN 0-521-59219-4 (Cambridge University Press, originally published in 1998). ^ Germain-François Poullain de Saint-Foix, Oeuvres complettes de M. de Saint-Foix, Historiographe des Ordres du Roi, p. 287, Volume 3 (Maestricht: Jean-Edme Dupour & Philippe Roux, Imprimeurs-Libraires, associés, 1778). ^ Étienne Baluze, Vitae Paparum Avenionensis, 3 Volumes (Paris, 1693). ^ Pierre Dupuy, Histoire de l'Ordre Militaire des Templiers (Foppens, Brusselles, 1751). ^ "Knights Templar secrets revealed". CNN. 12 October 2007. Archived from the original on 13 October 2007. Retrieved 12 October 2007. ^ Frale, Barbara (2004). "The Chinon chart – Papal absolution to the last Templar, Master Jacques de Molay". Journal of Medieval History. 30 (2): 109–34. doi:10.1016/j.jmedhist.2004.03.004. Archived from the original on 4 April 2014. Retrieved 1 April 2007. ^ Burman 1990, p. 28. ^ Barber 1993, p. 10. ^ International, American. "The Knights Templar and Knights Hospitaller". www.medievalwarfare.info. Retrieved 2017-12-11. ^ Selwood, Dominic (2013-03-20). "The Knights Templar 1: The Knights". Retrieved 12 April 2013. ^ The Rule of the Templars. p. article 17. ^ Barber 1994, p. 190. ^ Martin 2005, p. 54. ^ Selwood, Dominic (2013-04-07). "The Knights Templars 2: Sergeants, Women, Chaplains, Affiliates". Retrieved 12 April 2013. ^ Read 2001, p. 137. ^ Burman 1990, p. 43. ^ Burman 1990, p. 30–33. ^ Martin 2005, p. 32. ^ Barber 1994, p. 191. ^ a b Burman 1990, p. 44. According to William of Tyre it was under Eugenius III that the Templars received the right to wear the characteristic red cross upon their tunics, symbolising their willingness to suffer martyrdom in the defence of the Holy Land. The Pope conferred on the Templars the right to wear a red cross on their white mantles, which symbolised their willingness to suffer martyrdom in defending the Holy Land against the infidel. ^ Burman 1990, p. 46. ^ Nicholson 2001, p. 141. ^ Barber 1994, p. 193. ^ Harris, Oliver D. (2013). "Beards: true and false". Church Monuments. 28: 124–32 (124–25). ^ Nicholson 2001, pp. 48, 124–27. ^ Martin 2005, p. 52. ^ Newman, Sharan (2007). The Real History Behind the Templars. Berkeley Publishing. pp. 304–12. ^ Barber 1993, p. 4. ^ Martin 2005, p. 58. ^ Ruggeri, Amanda. "The hidden world of the Knights Templar". Retrieved 2017-12-11. ^ Barber 1994, pp. 194–95. ^ Finlo Rohrer (19 October 2007). "What are the Knights Templar up to now?". BBC News Magazine. Retrieved 2008-04-13. ^ a b Nicholson, Helen (2014). A Brief History of the Knights Templar. Little, Brown. p. 151. ISBN 9781472117878. ^ Malet, David (2013). Foreign Fighters: Transnational Identity in Civic Conflicts. Oxford University Press. p. 224. ISBN 9780199939459. ^ a b Napier, Gordon (2011). A to Z of the Knights Templar: A Guide to Their History and Legacy. History Press. p. 424. ISBN 9780752473628. ^ Knights Templar FAQ, accessed 10 January 2007. ^ "Freemasonry Today periodical (Issue January 2002)". Grand Lodge Publications Ltd. Archived from the original on 3 March 2011. Retrieved 2011-05-28. ^ Miller, Duane (2017). 'Knights Templar' in War and Religion, Vol 2. Santa Barbara, California: ABC–CLIO. p. 464. Retrieved 28 May 2017. ^ Louis Charpentier, Les Mystères de la Cathédrale de Chartres (Paris: Robert Laffont, 1966), translated The Mysteries of Chartres Cathedral (London: Research Into Lost Knowledge Organization, 1972). ^ Sanello, Frank (2003). The Knights Templars: God's Warriors, the Devil's Bankers. Taylor Trade Publishing. pp. 207–08. ISBN 978-0-87833-302-8. Barber, Malcolm (1994). The New Knighthood: A History of the Order of the Temple. Cambridge: Cambridge University Press. ISBN 978-0-521-42041-9. Barber, Malcolm (1993). The Trial of the Templars (1 ed.). Cambridge: Cambridge University Press. ISBN 978-0-521-45727-9. Barber, Malcolm (2006). The Trial of the Templars (2 ed.). Cambridge: Cambridge University Press. ISBN 978-0-521-67236-8. Barber, Malcolm (1992). "Supplying the Crusader States: The Role of the Templars". In Benjamin Z. Kedar. The Horns of Hattin. Jerusalem and London. pp. 314–26. Barrett, Jim (1996). "Science and the Shroud: Microbiology meets archaeology in a renewed quest for answers". The Mission (Spring). Retrieved 2008-12-25. Burman, Edward (1990). The Templars: Knights of God. Rochester: Destiny Books. ISBN 978-0-89281-221-9. Frale, Barbara (2004). "The Chinon chart – Papal absolution to the last Templar, Master Jacques de Molay". Journal of Medieval History. 30 (2): 109. doi:10.1016/j.jmedhist.2004.03.004. Hietala, Heikki (1996). "The Knights Templar: Serving God with the Sword". Renaissance Magazine. Archived from the original on 2 October 2008. Retrieved 2008-12-26. Martin, Sean (2005). The Knights Templar: The History & Myths of the Legendary Military Order. New York: Thunder's Mouth Press. ISBN 978-1-56025-645-8. Moeller, Charles (1912). "Knights Templars" . In Herbermann, Charles. Catholic Encyclopedia. 14. New York: Robert Appleton Company. Newman, Sharan (2007). The Real History behind the Templars. New York: Berkley Trade. ISBN 978-0-425-21533-3. Nicholson, Helen (2001). The Knights Templar: A New History. Stroud: Sutton. ISBN 978-0-7509-2517-4. Picknett, Lynn; Clive Prince (1998). The Templar Revelation. New York: Touchstone. ISBN 978-0-684-84891-4. Read, Piers (2001). The Templars. New York: Da Capo Press. ISBN 978-0-306-81071-8. Selwood, Dominic (2002). Knights of the Cloister. Templars and Hospitallers in Central-Southern Occitania 1100–1300. Woodbridge: The Boydell Press. ISBN 978-0851158280. Selwood, Dominic (1996). 'Quidam autem dubitaverunt: the Saint, the Sinner. and a Possible Chronology' in Autour de la Première Croisade. Paris: Publications de la Sorbonne. ISBN 978-2859443085. Sobecki, Sebastian (2006). "Marigny, Philippe de". Biographisch-bibliographisches Kirchenlexikon (26 ed.). Bautz: Nordhausen. pp. 963–64. Brighton, Simon (2006-06-15). In Search of the Knights Templar: A Guide to the Sites in Britain. London, England: Orion Publishing Group. ISBN 978-0-297-84433-4. Butler, Alan; Stephen Dafoe (1998). The Warriors and the Bankers: A History of the Knights Templar from 1307 to the present. Belleville: Templar Books. ISBN 978-0-9683567-2-2. Chisholm, Hugh, ed. (1911). "Templars" . Encyclopædia Britannica. 26 (11th ed.). Cambridge University Press. Gordon, Franck (2012). The Templar Code: French title: Le Code Templier. Paris, France: Yvelinedition. ISBN 978-2-84668-253-4. Haag, Michael (2012). The Tragedy of the Templars. London: Profile Books Ltd. ISBN 978-1-84668-450-0. Haag, Michael (2008). The Templars: History and Myth. London: Profile Books Ltd. ISBN 978-1-84668-148-6. Hodapp, Christopher; Alice Von Kannon (2007). The Templar Code For Dummies. Hoboken, NJ: Wiley. ISBN 978-0-470-12765-0. Partner, Peter (1990). The Knights Templar & Their Myth. Rochester: Destiny Books. ISBN 978-0-89281-273-8. Ralls, Karen (2003). The Templars and the Grail. Wheaton: Quest Books. ISBN 978-0-8356-0807-7. Smart, George (2005). The Knights Templar Chronology. Bloomington: Authorhouse. ISBN 978-1-4184-9889-4. Upton-Ward, Judith Mary (1992). The Rule of the Templars: The French Text of the Rule of the Order of the Knights Templar. Ipswich: Boydell Press. ISBN 978-0-85115-315-5. Wikimedia Commons has media related to Knights Templar.